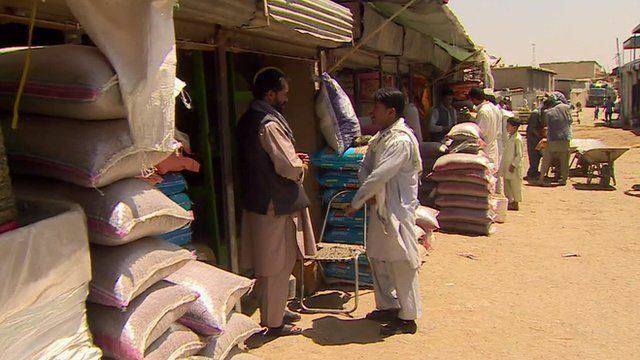 Afghan economy hit by political crisis Jump to media player Afghanistan's finance minister says the country's political crisis is having a serious impact on an already fragile economy. Afghan deal 'a win win situation' Jump to media player Afghanistan's new unity government will involve "an element" of power-sharing, according to presidential candidate Dr Abdullah Abdullah. No 'power-sharing' after Afghan deal Jump to media player Afghanistan's new government of national unity is not a "power sharing agreement", presidential candidate Ashraf Ghani has told the BBC. Afghan Romeo and Juliet 'live in fear' Jump to media player A young Afghan couple - who faced prejudice, threats and even jail after falling in love - are now finally married and living together. National unity deal for Afghan rivals Jump to media player Afghan presidential rivals, Abdullah Abdullah and Ashraf Ghani, agree to form a united government. after months of feuding. Afghanistan election 'back on track' Jump to media player Afghan presidential hopeful Ashraf Ghani says US Secretary of State John Kerry has helped put their election back on track. Afghanistan's finance minister says the country's political crisis is having a serious impact on an already fragile economy. Omar Zakhilwal told the BBC that if the deadlock between the two presidential contenders was not resolved soon, he would have to cut salaries and lay off government workers. A full audit of votes of April's presidential elections is not yet completed and there is still no deal on a government of national unity.